3. it separates two sheets of cells, such as the endothelial cells of blood vessels and epithelial cells of another tissue. This type of arrangement is found in the kidney glomerulus, where the basal lamina acts as a permeability barrier or sieve. Functions of the basal lamina. The exact composition of the basal lamina varies between different types of cell. In the kidney, the basal lamina acts as a molecular filter. At the neuromuscular junction, the basal lamina that surrounds the muscle cells, separates the nerve cell from the muscle cell at the synapse, and helps to regenerate the synapse after injury, and helps to localise acetylcholine receptors. The basal lamina provides support to the overlying epithelium, limits contact between epithelial cells and the other cell types in the tissue and acts as a filter allowing only water and small molecules to pass through. If the epithelial cells become transformed (cancerous) and become 'malignant', they are able to break through the basement membrane and invade the tissues beneath. This characteristic is one used in the diagnosis of malignant epithelial tumors. Components of the basal lamina. The basal lamina consists of a mixture of collagens, laminin (glycoprotein), perlecan (heparan sulphate glycoprotein), entactin (glycoprotein). 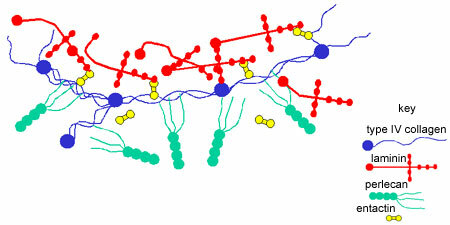 These proteins can bind to each other to make a highly crosslinked extracellular matrix as shown in this diagram. All epithelia have a basal lamina which lies between the cells and the underlying connective tissue. This layer is so thin that it is often difficult to see with conventional light microscopy and is usually only clearly defined under the electron microscope. The basal lamina helps to attach and anchor the cells to the underlying connective tissue. Proteins (integrins and proteglycans) in the cell membranes attach to proteins in the basal lamina, which in turn is linked to the extracellular matrix of connective tissue. lamina lucida - electron lucent (very little staining in the EM). lamina densa - electron dense. lamina reticularis - can be associated with reticular fibres of the underlying connective tissue. This picture shows the arrangement of these three layers of the basal lamina lies underneath an epithelial cell. The integrins and proteoglycans in the cell membrane that attach to proteins in the extracellular matrix/basal lamina communicate with and signal to each other. Cells can organise their own extracellular matrix, and the extracellular matrix in turn helps to organise cells. Changes in the integrins can mean that cells stop being adhesive, and staying put, to moving away, or vice versa. Dystrophin is a glycoprotein in the plasma membrane of muscle cells, that binds to laminin in the extracellular matrix. In muscular dystrophy, this protein is defective or missing, and reduces the attachment of muscle cells to their basal lamina. This reduced attachment results in muscle degeneration and muscle weakness. This picture shows a duct from the kidney, stained with alcian blue, where the basement membrane can be seen more clearly, underlying the cuboidal epithelium. See if you can identify the lumen of the duct, the simple cuboidal epithelium, and the basement membrane. This diagram shows part of the cuboidal epithelium in the photographs opposite together with its basal lamina.